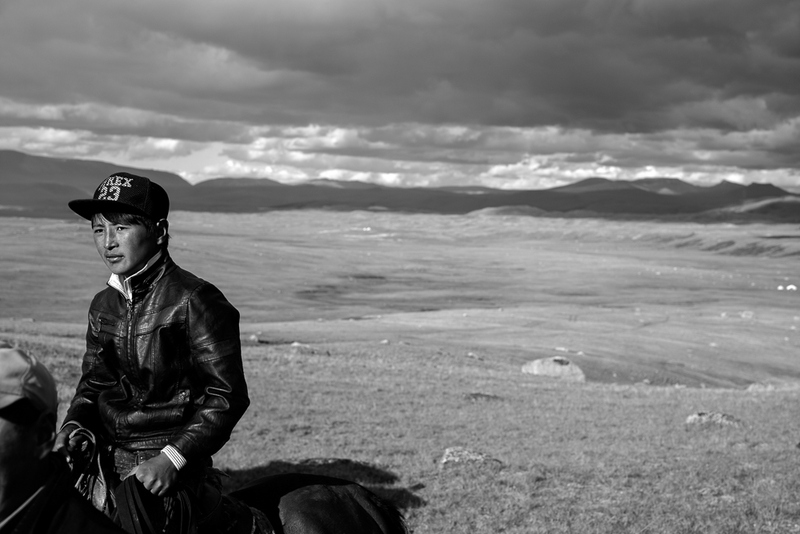 Adventure to Western Mongolia to meet Eagle Hunters and watch Nadaams. I’ve always wanted to visit Mongolia, last year I read up on what is known as the land of the big sky, and in particular the local western culture and festivals that the people celebrate. I found that Mongolia has a large number of Eagle Hunters as well as having a very short summer, in which they hold ‘Nadaam’ festivals. Nadaam festivals translate to simply ‘Games’. 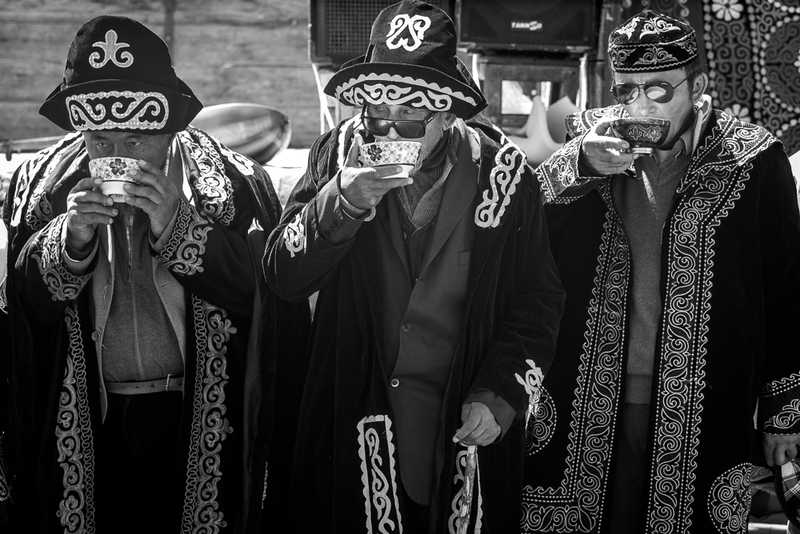 Local Nadaam’s are also sometimes referred to as ‘Eriin Gurvan Naadam’ meaning “Three manly sports”. Nadaams are used to celebrate many types of occasions, including weddings or spiritual gatherings. We had the wonderful opportunity to attend a traditional Kazakh Mongolian Wedding, which had the most spectacular background of the Altai Mountains. Mongolian food in general is an important part the culture and heavily reliant on the kind of foods that are suitable to a nomadic lifestyle; dishes are based on meat and fat from camels, mutton, cattle and yak, as well as a variety of dairy products. Milk is also used to make many things including regular salty tea, as well as butter, cheese and other foods, and can be use to welcome visitors into a family Gare. 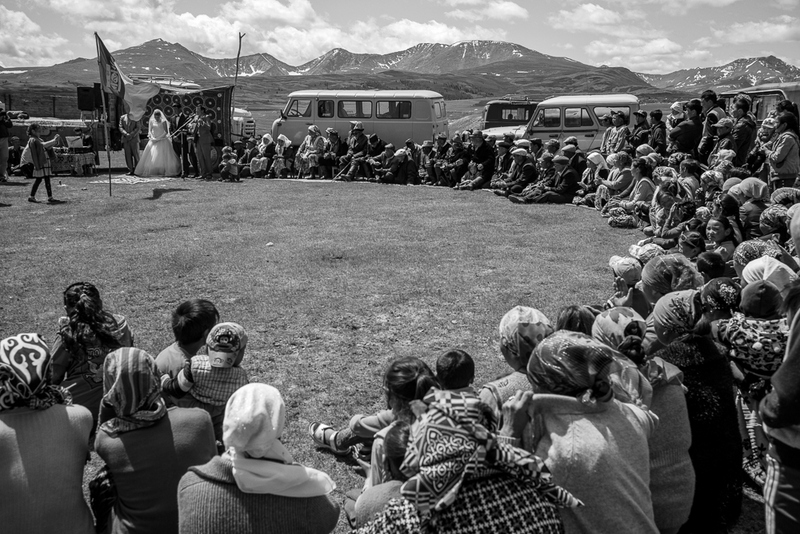 This Kazakh Mongolian wedding day, much like when visitors arrive, started with the Bride getting ready and dairy snacks, laid out in the Brides family Gare. A special part of the weddings was where mare’s milk is served from a large bowl just after the ceremony and freshly killed lamb served as the main meal. Mare’s milk (Airag) is fermented by the local family and contains between 7% and 8% alcohol. The Nadaam events are held after the wedding ceremony, and the first event at this wedding was the wrestling. 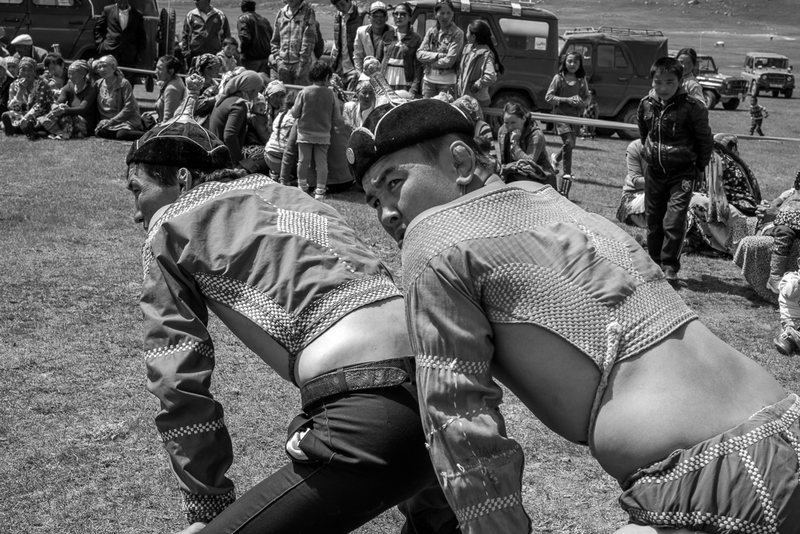 Wrestling or bökh in Mongolia is centuries old and is not played in a ring, but an open grassy field. The goal of a match is to get your opponent to touch his upper body, knee or elbow on the ground. The last event of the Nadaam and always the highlight for the spectators is the horse race. Horse races in Mongolia are very different to western ones, which tend to consist of short sprints generally not much longer than 2 miles. Mongolian horse races are cross-country events, raced across the Mongolian valleys, which can between 12–25 miles long with lots of horses. The jockeys (children from 5 to 13), are an important element to the race, but the main purpose of the races is to test the skill of the horses. The image above shows the final strides of the horse race, with the race marshals and fathers running into slow the horses down. With horse races lasting for a few hours or more between each one, there is always some down time. This can be fun with social interactions, like parties, music and dancing. During the gaps between the races other entertainment can happen, like this local rider who likes to stand on the horse. 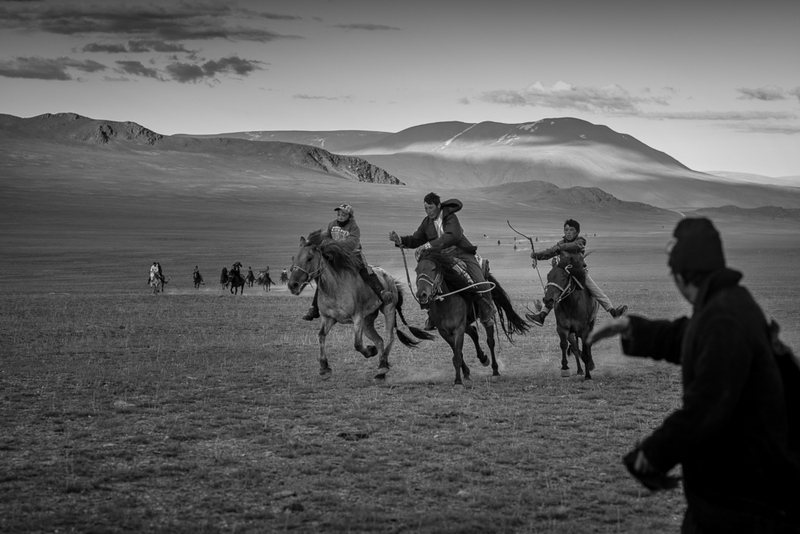 On rare occasions, the local people hold Buzkashi. Buzkashi is the traditional sport of Afghanistan, but was previously banned under the Taliban regime. This traditional sport is a highly competitive game and involves horse mounted players who traditionally drag and fight in a tug of war style a disembowelled and decapitated goat, then throw it to the floor when its been won. The Buzkashi competition in image below used a rag in replacement for the goat. 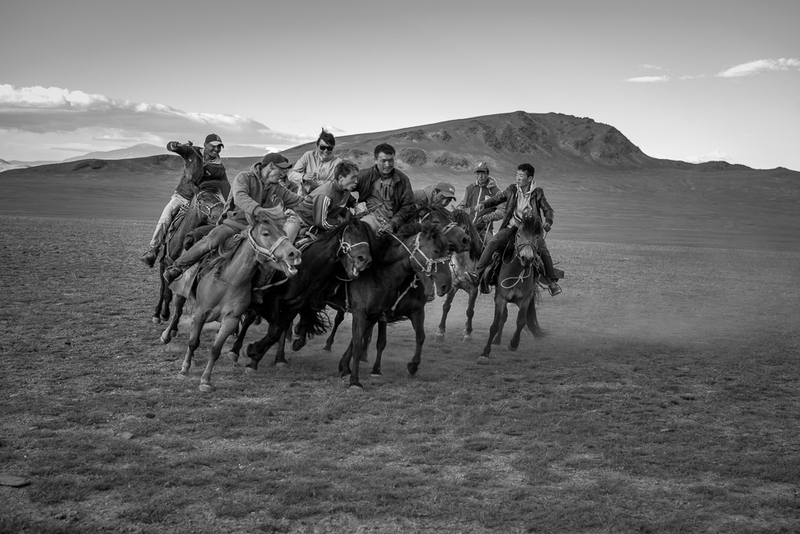 The Buzkashi can be very fierce when all the riders and horses come together. The western part of Mongolia hosts many Eagle hunters, one of which is Silau (below). Silau is an eagle hunter that we met at the wedding, and he asked if we would like to join him and his sons on a hike to check and collect the Balapan. A Balapan is a 2 year old baby Eagle which nests within the mountains. Silau had already identified this Balapan as a new bird to train for future years. Near the local western town of Ulgi, the 90th Anniversary Nadaam was taking place. At this larger Nadaam, we had the chance to see an archery competition. 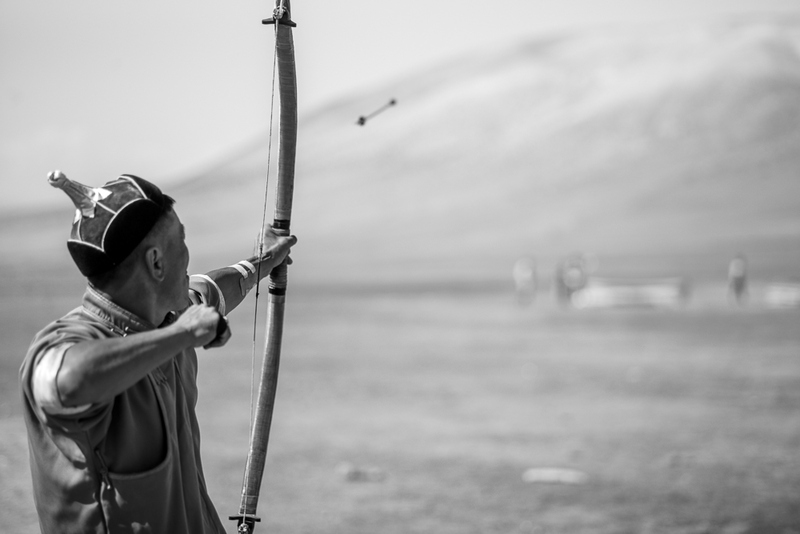 Archery is the only game in the Nadaam, which is played by both male and female competitors. For this trip a decided to take the Leica M240, as well as the Leica Monochrom M246. My standard lenses are from the Summicron range, comprising of 35, 50APO and a 90APO. On this trip, I did have the opportunity to take the new Leica M246 for my black and white work. I like shooting with the Monochrom because I find it pulls texture and details out of the scene, which is different to the way that colour images are captured. 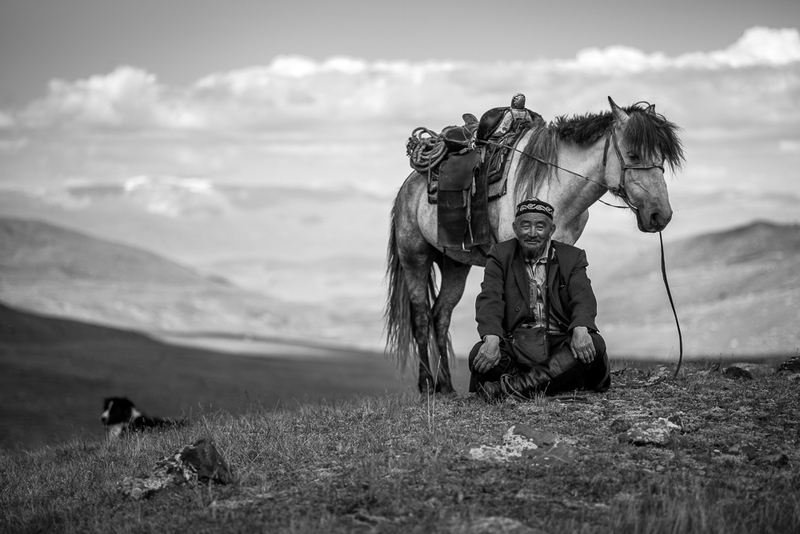 With the dusty environment, horses, dark skin and interesting faces, this camera and Summicron lens combination would help to tell the story of this wonderful Nomadic culture. I also always take my Lee Graduated filters and Natural density filters just in case I’m shooting photographs and need a shallow depth of field in bright daylight, or I am shooting landscapes with moving water. I also, take my Zoom H6 for audio, just in case I need to shoot some video on my M240. When you go somewhere that is completely new, everything is engaging there is a want to photograph everything, kind of a trigger-happy moment for at least the first few days. Once the excitement is over it’s time to settle and work out what the project(s) will be about, and this usually takes a little time and patience to work out. Somebody once gave me some great advice, and recommend that the first few days should be experienced without a camera, as this can give perspective and time for projects to be created. Once a few projects have been identified, I find it much easier to focus on what images are needed to help tell the story and what not to take photographs of. One benefit of this technique for me, is that it tends to lead to better and a higher quality of pictures to select from when I get back home. To be honest though, I still can’t leave my camera at home on those first few days, and I do like to get carried away with the visual excitement of everything. However, the projects always appear at at some point. 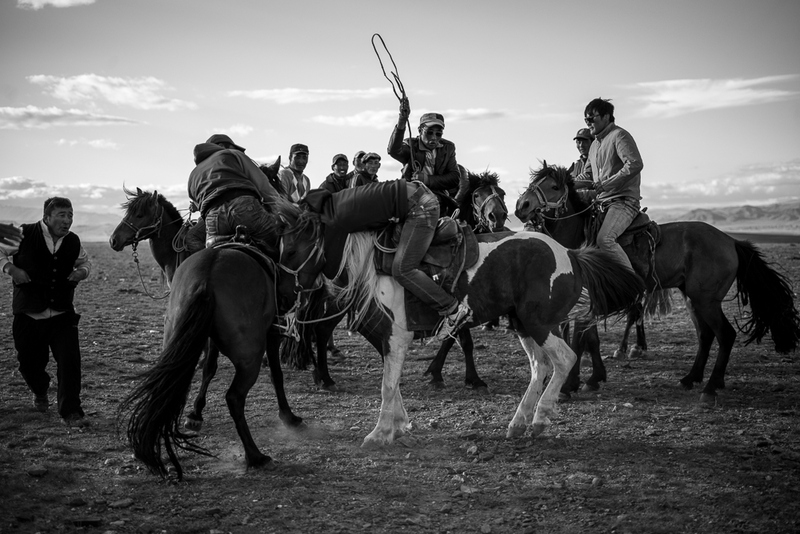 Some of the events, especially the horse racing and Buzkashi are very fast paced, so judging the decisive moment, and getting the correct focus point can be extremely challenging, and did lead to a few missed shots. Great backgrounds make great photographs, and something which I can be taken for granted. From the Mongolian experience, I’ve defiantly appreciated hunting out a great background, and then put something in it (even if it involves posing someone). A take away from this experience is that including many complimentary elements in the scene, as well as a human presence can make the final image much more exciting and engaging. Fixers. These people are the key to successful photographs. We had great fixers on this trip, which made the culture more accessible and thus easier to photograph and get better pictures. 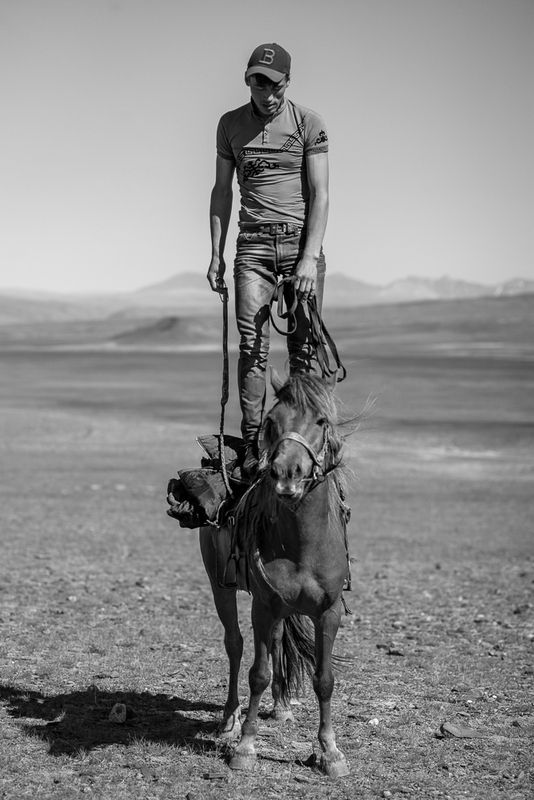 As a reflection, we met a couple of other photographers, who were having a miserable time in Mongolia all because they didn’t have the right fixers in place, that had the correct local knowledge and open up the opportunities. I have been taking photographs for over 20 years with a view of just to document my life and it’s surroundings. I came from the film days and moved into digital photography about 10 years ago. I bought my first Leica camera 2 years ago (the M240) and recently had the opportunity to go back to classic photography by buying a Leica M/A and started to use Film as part of my work once again. I also love to print, whilst I enjoy printing with Inkjet, I’m very passionate about alternative printing, and have been making Platinum prints using Digital Negatives for a while now. This process was founded in the 18C and apart from making a digital negative and printing it on acetate, the wet processing side of it hasn’t changed. but this is a life project, one that I’ll continue when I get time to devote to it.